There have been a lack of posts simply because I haven’t been doing many new physical activities. I more or less stopped training completely in March, both upper body, due to the elbow injury from the Jiu Jitsu tournament, and lower body, due to the pain I was feeling in my foot and knee. The elbow injury has healed and I am able to now continue upper body weight training with little to no issue, however, the prognosis for the foot and knee were not as good. An x-ray of my right foot revealed a tailor’s bunion on my right foot which is a deformation at the head of the fifth metatarsal bone at the base of the little toe, must likely caused by any of the activities I’ve been doing or a combination of. An MRI of my right knee revealed iliotibial band syndrome and something called synovitis in the patellofemeral compartment. I’m not positive what the latter is other than it is some sort of inflammation in the knee. The former is inflammation of a the iliotibial band which is a thick band which cross the hip joint and goes all the way down into the knee. Apparently it is difficult to treat. I was told I will need physical therapy for awhile and that I shouldn’t be running. That means all those mud runs and races I’ve been planning are most likely and the cutting board. 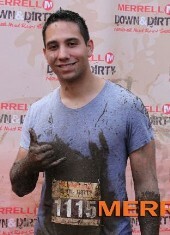 I’ve already regrettably missed the two Tough Mudder runs that I had signed up for. As for the martial arts, I’m going to see if I can continue but do it extremely light until this is resolved.